This weeks task was to compose a Self Portrait made up of items that somehow represent myself. I chose these items to include in my self portrait to represent the spiritual aspect to my life which runs very strongly through me. The scarf I got in India in 2006 which was a trip that was very influential in shaping my future afterwards. It is like the foundation to the other elements. 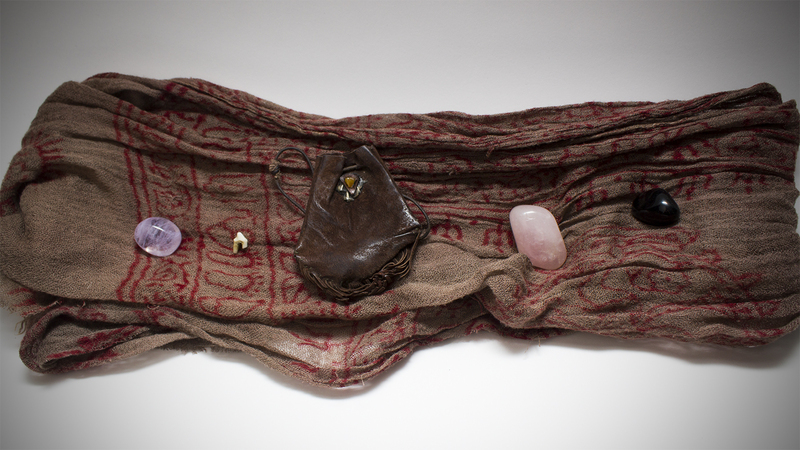 In the middle of the composition is a medicine bag that was made by a close friend, that holds a few sacred items, including the dogs tooth which sits next to it. This tooth is from one of my own dogs, and represents to me loyalty, friendship, family and connection to nature. I feel a deep connection to dogs as well as other animals, and used to work as a dog walker, which I adored. The other included items are special crystals that have been gifted to me at momentous times or otherwise discovered on my travels, that bring insight, comfort and inspiration to my world, and are never far from my side. I chose to arrange them in a line like that because no piece takes precedence over the others, so I wanted a equal composition.